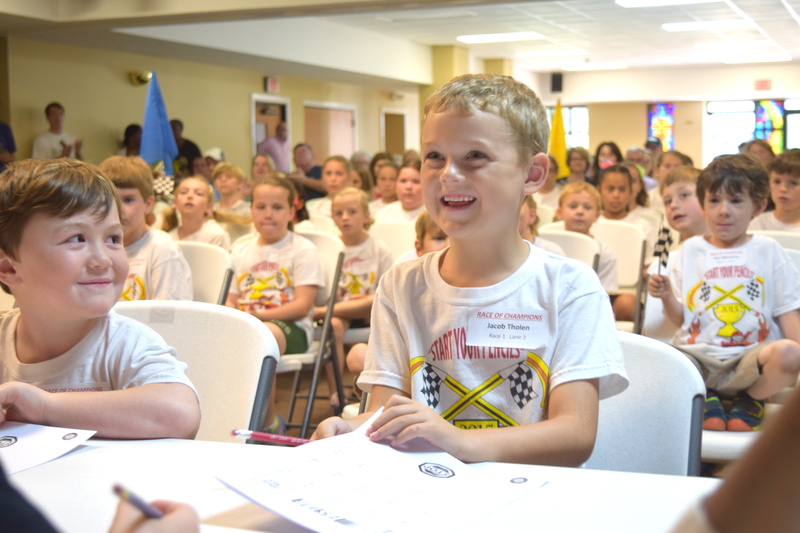 Read Port City Daily’s coverage of the FASTAR Race of Champions here! Read our press release, below! Lake Waccamaw— Students from three local charter schools converged at Lake Waccamaw to represent their school in the third annual FASTAR Race of Champions, a NASCAR-themed academic competition which sees students “race” to complete workbooks of 50 math problems and a reading passage at top speeds of two minutes. “FASTAR” stands for Fluent Academic Skills Tournament in Arithmetic and Reading and was developed 11 years ago by The Roger Bacon Academy, Inc. (RBA), the Leland-based management company of a network of local public charter schools. This event saw “champions” from each of the three schools compete as a team to bring home the FASTAR cup to their campus. “Champions” are students who earned top finishes in their school-wide FASTAR competition last month. Grouped by grade level, K-5 students complete reading and math problems with both speed and accuracy, as incorrect answers result in time penalties. Participating schools were Charter Day School in Leland, Columbus Charter School in Whiteville, and for the first time, Douglass Academy in downtown Wilmington. Fifty-four champion racers contributed to each school’s team score. The results were sensational to those watching and confirming to educators present. The three schools finished with times spanning a one-second difference. This demonstrates that students at Douglass Academy, a public charter school opened only two years ago, are as fluent in reading and math as students at Charter Day School and Columbus Charter School, the highest scoring elementary schools in Brunswick and Columbus counties, respectively. As part of the RBA network, the three schools offer an identical classical curriculum and use the Direct Instruction teaching method. RBA spokeswoman Sawyer Batten states that these results are encouraging, but not surprising. “The RBA network has grown from a demand to replicate its innovative educational program in new areas. Charter Day School opened in 1999 and soon became the top-performing school in Brunswick County. In 2007, we replicated the Charter Day School model in neighboring Columbus County, where Columbus Charter School has also become its county’s top performer. Douglass Academy is the third replication of this program, and just this year, South Brunswick Charter School in Southport became the fourth,” she explained. “Though we expect each replication will yield the same academic results, Douglass Academy’s equal matching of its established sister schools’ performance so soon is stunning, inspiring, and significant,” she continued. Douglass Academy parent Marcia Corbett, shared that FASTAR has given her daughter Mykhia the gift of recall. “It has helped Mykhia to learn her math facts by not just counting her fingers, but by memorizing them because in FASTAR, you don’t have time to count on your fingers. This will help her in every grade and for her whole life. I am very proud,” she stated. Despite Douglass Academy’s incredible performance, Whiteville’s Columbus Charter School won the FASTAR Cup for the second year in a row, with racers from Charter Day School finishing six one-hundredths of a second behind. Preparations for next year’s races will begin in January, with individual school competitions to follow in April. Each of the tuition-free public charter schools is currently accepting enrollments for the 2015-2016 school year. For more information, please visit www.rogerbacon.net.